Are the viewport movements in DAZ Studio getting you down? Does it seemingly take forever to make a small camera adjustment, despite your decent hardware? Check if Hardware Acceleration is enabled – because it isn’t by default. They do this so that most hardware will work with DAZ Studio out of the box, but they don’t really tell you where to enable it if you’d like to try for a much better user experience. 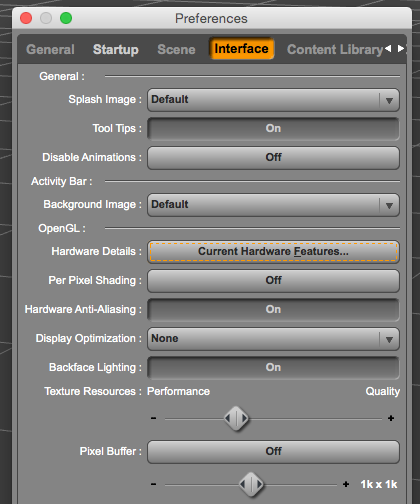 Head over to Preferences – Interface and take a look at the OpenGL section. The biggest improvement can be achieved under Display Optimisation. It’s set to “none” by default, which means no hardware acceleration is at work and your CPU does most of the calculations for the viewport. Try “better” or “best” and see how your hardware holds up. The change will be effective immediately, there’s on need to save anything or restart the app. There’s a slider labelled Texture Resources that lets you move from Quality to Performance, it’s something else to play around with for smoother responses. You can also take a look at the Hardware Details to get a list of features your system supports. If your hardware supports Pixel Buffer, turn it on too. And lastly there’s Per Pixel Shading and Hardware Anti-Aliasing. The latter is switched on by default, while the other one is not – it’ll make your scenes look even better if your hardware can cope with it (otherwise, leave it switched off). The effects of these settings will best be noticeable in medium to large scenes, anything with a couple of characters and a full background set. With Hardware Acceleration enabled you should be able to move your camera much quicker and smoother though the scene. And if it ever gives you grief, turn it off by switching it to “none” again – at least you’ve tried. There’s no “one setting is best” approach here because every combination of hardware is different, but I can tell you that on both my Mac systems the “best” setting without anything else has increased performance dramatically – and it didn’t even cost anything.